A property of ellipsoids is that if the inside surface is a perfect reflector, a ray of light originating at one focus will reflect off of the ellipsoid and pass through the other focus. In the figure below FC is a portion of ellipse with foci A and B. DE is a portion of a larger ellipse also having foci A and B. Arcs CD and EF are part of the circle with center B. Points A, C, and D lie on the same line and A, E, and F are also collinear. Think of a perfect reflector made by revolving this shape about line AB to form an axisymmetric shape. Any photon originating at A must strike one of the ellipsoid surfaces and will be reflected toward B. For photons orginating at B, some strike the ellipsoids and reflect toward A, but some also strike the spherical portion of the reflector and come right back to B. Take two small identical objects of the same temperature and place one at A and the other at B inside the reflector. Also the rest of the space inside the reflector is vacuum. Objects emit thermal radiation based on temperature in the form of photons. All the radiation from A strikes B. Only a fraction of that emitted from B arrives at A. So with time B will become hotter than A. In theory, this temperature difference can be used to generate power. If this would not work, why not? If it would work, why aren't ellipsoids being used to generate power? Energy can't come from nowhere, therefore it can't possibly work. But where is the problem in the logic? All the radiation from A strikes B. Only a fraction of that emitted from B arrives at A. So with time B will become hotter than A. In theory, this temperature difference can be used to generate power. 1. how are you going to find a perfect reflector? 3. Wouldn't photons bounce off the objects as well? Energy can't come from nowhere, therefore it can't possibly work. The energy doesn't come "from nowhere", it's just transferred from one object to the other. 1. & 2.: This is meant to be a "gedankenexperiment" (I suppose). 3.: I suggest we use perfectly absorbing black bodies. For photons orginating at B, some strike the ellipsoids and reflect toward A, but some also strike the spherical portion of the reflector and come right back to B. Take two small identical objects of the same temperature and place one at A and the other at B inside the reflector. All the radiation from A strikes B. Only a fraction of that emitted from B arrives at A. So with time B will become hotter than A. On condition that the amounts of radiation originating from the two bodies are the same. This, however, is not true, because when the object at B gets hotter, it will emit more radiation. I haven't done any calculations and generally don't trust my intuition with regard to thermodynamics, but this seems to be an important point. After all, this thing should eventually settle down in a dynamic equilibrium, shouldn't it? If this would not work, why not? Basically, it's because of the second law of thermodynamics, I'd say. "You're a jerk, <your surname>!" Obviously, getting power from this situation would violate the 2nd Law of thermodynamics, but the 2nd law of thermodynamics is an observed principle - i.e. we believe it to be true simply because we have never seen it broken. Because of the 2nd Law, we can be confident that there is a flaw in the scheme. The puzzle here, as with James Fingas' osmotic perpetual motion machines, is to figure out what that flaw is - if no flaw can be found, then it means that the 2nd law is false after all. The flaw is not directly in the lack of perfect reflectors or blackbody radiators, since we can closely approximate both - close enough that losses would be less than the energy gain. The increased radiation from B will cause it to eventually reach an equilibrium, but at a hotter temperature than A. The question is, why can we not harness that temperature difference to run a heat engine? Presumably we could add heat conduits running from each focus to the apex of the ellipse on its side. Such conduits would not interfere with the transfer of heat between A and B, since no light path between the two foci crosses these lines. By means of these conduits we obtain the same temperature differential on the outside of the apparatus, where we can hook it up to our heat engine. As long as the heat flow through the engine does not exceed the ability of A to transfer heat to B, our engine runs for free! So, where is the flaw? It would be a nice way to refridgerate things..
A corrollary of the second law of thermodynamics is that no machine can be made which transfers thermal energy from a cooler object to a hotter object with no energy input. Therefore, if the second law is indeed true, point B cannot become any hotter than point A. The flaw is not in how to get the energy out. 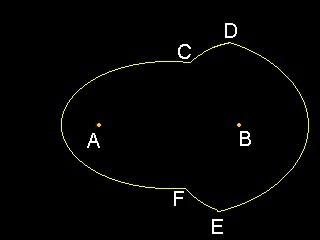 lA and lB are the distances to the ellipse from point A and from point B respectively. 2) If we choose the objects to be the same size, then object A is effectively larger compared to CF than object B is compared to DE.In this case, photons from A will have a much worse focal accuracy than photons from point B. dA will be roughly the radius of object A, but lA will be a lot smaller than lB for photons hitting CF, and will be fairly close to lB for photons hitting DE. 4) Because of this, some of the photons from object A end up returning to object A. You can see that the proportion is roughly equal to the size of DE over the size of CF, which also dictates the fraction of photons from object B that return to object B (by dictating the size of the circular arcs). 5) Now you say: what if we made object A smaller than B so that all of the photons from object A hit object B? The problem here is that the quantity of photons emitted is proportional to surface area. B will be emit more photons than A, exactly cancelling out any accuracy increases. 6) Now you say: what if we just shrank object A and object B until they were right at the focal points? The problem here is that no matter how small you make them to increase focal accuracy, the required focal accuracy decreases at the same time. In other words, you don't gain anything. Well, I guess James Fingas is right from a practical standpoint, but I think there is another flaw in the theoretical portion of this question (besides the fact that it violates the law of entropy). Firstly, to address the other posts, the temperature difference could theoretically be used to power stuff and all, its just that the total thermal energy of A and B will drop when this is done. Therefore, I don't think that's the flaw. What I noticed is that for this question, the radiation pressure will not be uniform, so one will notice a net force in the direction of AB. If the reflector isn't fixed in place, the drift will result in the photons near B losing KE, thereby 'correcting' the imbalance in radiation pressure, and these less energetic photons would in turn impart less KE to B compared to the ones near A, so the temperature may revert to its original value. If one takes the drift into account, the photons will no longer always pass through the focal points. OK, so that's not a problem with the First Law, but it's still a problem with the Second Law. Getting work for no cost other than some objects getting colder is a decrease in entropy, which isn't allowed. And if you're worried about the mirrors drifting relative to the blackbodies, then just put attachment struts along the axis where they won't interfere anyway. I did actually figure out the same problem that James did, but unfortunately, he beat me to the keyboard. For that matter, I didn't work out the math, either. I was just relying on "well, the math has to work, or the laws of thermodynamics wouldn't be valid!". The heat conduits along the axes necessary to get the supposed temperature difference out where it can be used could also double as supports to keep the radiators centered at the foci. I don't see the size of the radiators as being a true flaw, anymore than the other abstractions are. If the device would work at the abstract limit (point radiators, true blackbodies, perfect reflectors, perfect heat conduits of zero radius), then it should be possible to approximate it near enough to still see an entropy decrease. The flaw has to be in the argument that heat will transfer from A to B in the first place. That in and of itself is a violation of the 2nd law. Note that every light path from A to B is also a path from B to A. Though I have not followed the idea far enough to see if it works, I am curious if perhaps B will radiate just as strongly back along these paths as A is radiating B, (with A and B at the same temperature). Its true that " every light path from A to B is also a path from B to A", but the converse isn't true: that is the crux of the problem. As many of you have acknowledged, the size of the components isn't the main flaw: I still feel that the problem lies in the imbalance in radiation pressure within the system. I really think that the size of the radiators is the key here. The problem has no meaning for zero-size radiators, because they can't radiate anything and they can't accept any radiation. For sizes larger than that, you have the radiator-size problem. The reason the math works out that way for point radiators is that the behaviour of the mirrors has a discontinuity at that point. For any finite-sized region of space, there's no problem. It's the same problem as the Carnot efficiency of a heat engine with a heat sink at absolute zero. Theoretically, you can get 100% efficient conversion of heat to energy. That's because the equation doesn't work at that one point. But for any finite range of heat source and heat sink temperatures, there's no problem. Hmm...James Fingas is right...the problem does lie with infinitely small points. Furthermore, it doesn't really violate the law of entropy in such a case: the photons, which all originate at 2 points, get increasingly disordered and scattered about throughout the interior of the reflector, so even if A does experience an increase in temperature, the change in entropy will likely >=0. Sorry, but I still don't buy it. If you could design the radiators to emit photons only in an essentially radial direction, then the size of the radiator would not matter (almost anyway - it still gets in the way of some paths). Photons would take the same paths as if they were emitted from the foci. Basically, my objection to this "solution" is that it is more of an engineering limitation, rather than anything fundamental. I believe that there is a deeper reason that this set up fails. PS: James, your Carnot example doesn't work either. The only reasons we can't get perfect conversion of Heat into energy at absolute zero is that (1) by the 3rd LoT, we can't ever reach absolute zero, and (2) by the 2nd LoT, we can't ever reach the limiting efficiency of a Carnot cycle. The equation itself is accurate for T=0. And as we approach T=0, and reversability, effeciency does approach 100%. How do you restrict the radiators in this manner? A hint for thinking about this: What happens when a photon from elsewhere strikes a radiator obliquely? If it gets absorbed, then the baffles or whatever you've installed must also be able to radiate away photons in that direction. If it passes right through the baffles, then the baffles also can't restrict the outgoing photons. If they reflect the photon, then you've essentially got absorbtion and instantaneous re-emission, from that illegal point. Another way to think about this: When you have an object in front of a curved mirror, you end up with a magnified image. Optically, that magnified image will behave exactly like a real object of that size. Put the object right at the focal point, and the magnification will be infinite. When you have finite-sized objects, we know what this means for the images: You'll effectively have two infinite blackbody plates parallel to each other, which will therefore be at the same temperature. But what does infinite magnification do to point objects? Actually, in the idealized case, that would not be a large problem, since the only source for photons would be the other radiator, and any rays from it that strike the reflectors would be coming in normal to the surface. The only case where photons would come in obliquely would be those that pass straight from one radiator to the other. The smaller the radiators are with respect to the overall size of the apparatus, the smaller the entropy gain from this is. So you still could have an overall entropy decrease. But it is NOT my point here that the finite size problem is solvable. I don't know if my suggestion is workable, or if it can or cannot be solved by another means. What I am arguing is that the size problem is not the ultimate solution to this: I believe that there is a flaw in the analysis that has nothing to do with size. That if you could solve the size problem, you would discover that A and B still remain the same temperature. With suitable design of the radiator and mirror shapes, you could ensure most of the photons leaving A arrive at B. And that those leaving B on the left arrive at A. Those emmited by B on the right are trapped behind the middle reflector and bounce around until they are eventually reabsorbed by B. The same situation as SWF describes in the original problem ensues: more photons going from A to B than from B to A. Okay, I admit that is a little vague, but if the analysis SWF provides were accurate, and the only problem with the ellipsoidal generator were the finite size of A and B, then getting around the 2nd LoT would only require dreaming up a way to get object A to expose more radiating solid angle to B than B exposes to A. This does not strike me as an impossible task. The ellipsoidal method is just one of many possibilities for accomplishing this. I have to believe that there is a deeper miscomprehesion in the analysis given, and that two objects A and B at the same temperature will radiate each other equally regardless of how much radiating solid angle each has exposed to the other. At the initial state, the energy will reside entirely in A and B. After that, however, there will be energy in the form of photons scattered about the container/reflector (radiation pressure). This would mean an increase in entropy that might negate the entropy loss due to the increase in temperature in B. Actually, in SWF's original idealized scenario, if I may be allowed to ignore the size problem for a moment, this is not the case. Because we are assuming perfect reflectors, the photons are not scattered, but move along very definite paths. Information is not lost, so there is little entropy associated with the photons. My own suggestion is not well-enough defined to say one way or the other. But even if there is enough entropy in the photons to cover the entropy loss, you could "seed" the container with photons before your experiment begins, so any entropy associated with the photons is already present, and your experiment will show only the decrease. So has anyone come up with a reasonable explanation yet? Actually, in the idealized case, that would not be a large problem, since the only source for photons would be the other radiator, and any rays from it that strike the reflectors would be coming in normal to the surface. You're missing the point. Suppose you build your custom-made radiators, which are guaranteed to radiate only radially, and put them in SWF's device. I then open up the device, take out one radiator, and put it out in the middle of a sunny field where light can hit it with any impact parameter. What happens to the off-center photons? If your device interacts with off-center photons in any way, then it can also interact with them in an exactly time-reversed manner: If it can absorb an off-center photon, then it can emit a photon along the exact reversed trajectory, etc. If your device does not interact at all with off-center photons, then you're effectively back to saying that it's zero size, which is unphysical. If your device interacts with off-center photons in any way, then it can also interact with them in an exactly time-reversed manner: If it can absorb an off-center photon, then it can emit a photon along the exact reversed trajectory, etc. So it reflects photons unless they come in at a vertical angle. Non-vertical photons reflected does not significantly interfere with the heat transfer mechanism, since in this scenario, they are extremely rare. And this is physically possible - every boundary has an angle outside of which all light is reflected, not absorbed. But you seem to be missing MY point. Which as I said earlier is NOT that the size problem is solvable - I have admitted to not being sure of that - but rather that there must be something else wrong with the analysis SWF supplied. If SWF's analysis were correct other than accounting for the size, then getting around the 2nd LoT would still be possible. If not by this scenario, then by some other. Alll you have to do set up two objects so that one has a larger section of solid angle radiating at the other object, than the other object has radiating at it. If SWF's analysis were correct other than accounting for the size, then getting around the 2nd LoT would still be possible. If not by this scenario, then by some other. Alll you have to do set up two objects so that one has a larger section of solid angle radiating at the other object, than the other object has radiating at it. This isn't a problem, unless you show that such a setup is possible. Your text drawing won't do it, either: It'll behave the same no matter where you put your "barrier mirror", in particular, what you have is the same as putting the barrier in the middle (with the same hole cut out of it). Each blackbody receives as many photons as it emits. Nor will towr's solution of supercooled superabsorbant material work. A superabsorbant material is a blackbody, and it absolutely will radiate. Decrease the temperature, and it'll radiate less, but it'll always be radiating some. When one of these cold radiators absorbs a photon and heats up slightly, it'll also increase its radiation rate slightly until it next emits a photon, thereby staying in stable equilbrium. All that making the objects cold accomplishes is that it means there will be less photons bouncing around inside. I'm sorry, but I don't feel free to glibly assume that because I haven't thought of a way to do something, it must not be possible. I have seen lots of variations of "Maxwell's Demon" before, and they all had a more fundamental flaw than the size problem is here. I still think that there must be something else wrong with this idea. Actually, two weeks later ( ) I got the same answer as did James Fingas, using much the same logic. I really DO think the size is the case here. Coming from optics, I can tell you that “point sources” are used all the time – but only at a distance. Going “inward” to the point source will yield any number of “paradoxes” (e.g., we can “show” that light diffraction doesn’t exist). The point source black bodies used here may yield no energy – other wise they have infinite brightness (and the brightness conservation law will yield many more paradoxes). Approximating it with any finite size body (small as you wish) will have the problems mentioned by James (the magnification mismatch => losses are not symmetrical). I think conservation of impuls might be the problem.. photons have impuls, and it needs to be conserved. Photons veering of to the circle parts break that balance if the contraption doesn't move, and if it does move photons will be moving all over the place increasing entropy..